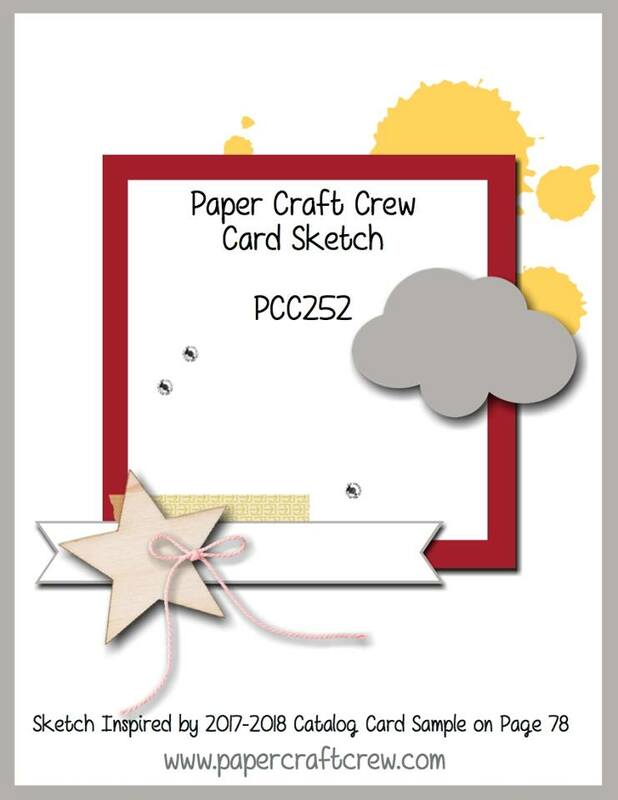 Welcome to PCC252 Sketch Challenge with the Paper Craft Crew! Before we move on to this week’s challenge, I just have to say that I have been blown away by all of the amazing projects that you’ve been creating and posting to our challenges. It’s been such fun seeing all of the projects, and reading how you created them! I always love reading about the creative process; it’s so interesting. So many great elements in this sketch! Remember, the sketch is your ‘jumping off’ point; you don’t have to stick with it exactly. For example, the cloud shape doesn’t have to be a cloud – substitute something else for it, just keep the basic sketch outline the same. I definitely changed up the shapes in my card – have a look! Yes, I came back to one of my favourite suites in the new catalogue – the Coffee Cafe Suite of products! Once I decided on which pattern from the Coffee Break Designer Series Paper I was going to use, I pulled my colours from it. I took a panel of 4″ x 5 1/4″ Soft Sky cardstock and stamped the cup rings from the retired Gorgeous Grunge set in Early Espresso ink. Then I used the splotches from the Timeless Textures stamp set, (which look like coffee spills to me) and stamped them in Crumb Cake ink. 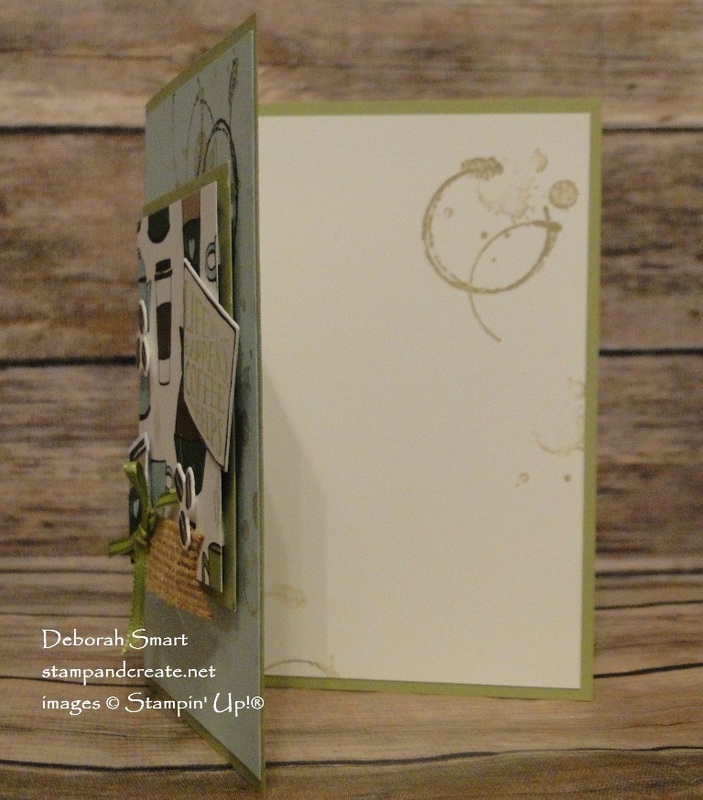 After stamping, I used the Multipurpose Liquid Glue to attach it to the Pear Pizzazz cardstock base. 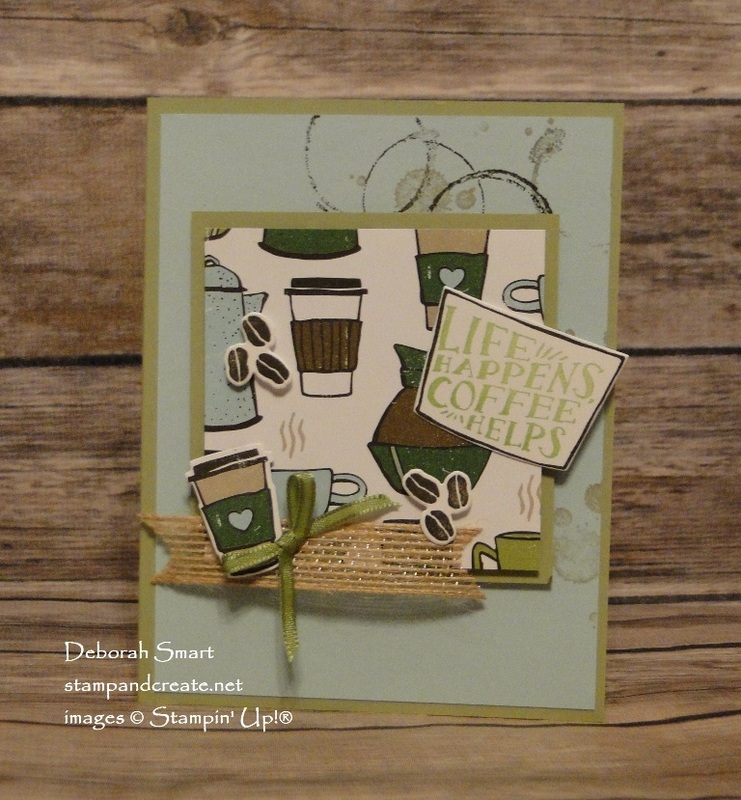 Next, I layered a square of the Coffee Break DSP onto another panel of Pear Pizzazz cardstock, popping it up with Stampin’ Dimensionals. The small coffee cup was die cut directly from the Coffee Break DSP, using the coordinating Coffee Cups Framelits Dies. Talk about making life quick & easy! (plus, you can Bundle the stamp set and Dies, and save 10%!). The coffee sleeve outline was stamped onto Whisper White cardstock, then the sentiment stamped inside of it, in Pear Pizzazz ink. I love the sayings in this stamp set – they’re so applicable to my life – and love of coffee! Cutting a small length of Burlap Ribbon and snipping banner tails on each end, I layered it underneath the little coffee cup. The bow is made of 1/8″ Sheer Ribbon, and attached with a Mini Glue Dot. 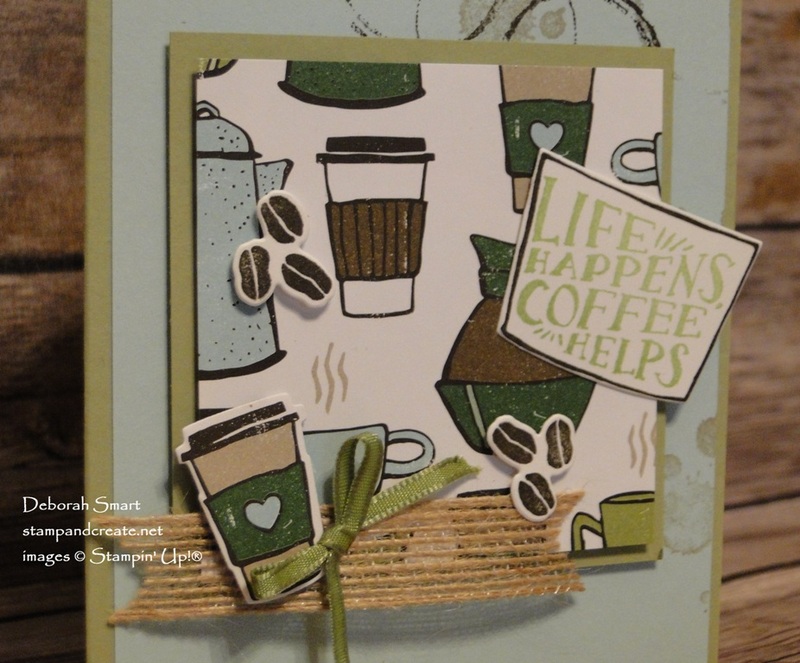 After adding the sentiment, I decided to add a couple of little embellishments, in the way of stamping and die cutting the coffee bean trios! Here’s a close up, so you can see all the details. Those little beans are so cute – and easy to make, since there’s a die for them! Don’t forget that this is Bonus Month! For every $60 order during July, you can earn a Coupon Code for $6 off any order (of any amount) in August! That means you can get the Coffee Cafe Bundle (#1453331 $59.25), add in one other item from the suite (like maybe the Corrugated Elements for $4.75, #144158) and get yourself an automatic $6 Coupon Code! If you’d like to re-create my card as above, just click on the images below to order the supplies. Or contact me directly, and I’m always happy to place your order for you.